No. 661 Squadron was a Royal Air Force Air Observation Post squadron associated with the Canadian 1st Army and later part of the Royal Auxiliary Air Force. Numbers 651 to 663 Squadrons of the RAF were Air Observation Post units working closely with Army units in artillery spotting and liaison. A further three of these squadrons, 664–666, were manned with Canadian personnel. Their duties and squadron numbers were transferred to the Army with the formation of the Army Air Corps on 1 September 1957. No. 661 Squadron was formed at RAF Old Sarum on 31 August 1943 with the Auster III and in March 1994 the Auster IV. The squadron role was to support the Canadian 1st Army and in August 1944 it moved to France. Fighting in the break-out from Normandy it followed the Canadians across the low countries and into Germany. The squadron disbanded at Ghent, Belgium on 31 October 1945. After the war the Air Observation Squadrons were reformed and No. 661 Squadron Royal Auxiliary Air Force was as such formed at RAF Kenley on 1 May 1949, consisting of five flights -nos. 1957, 1958, 1959, 1960 and 1961 (Reserve) AOP Flights-, to provide support to the Army in the south London and Surrey area until it was disbanded on 10 March 1957 at RAF Henlow. 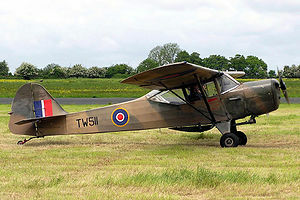 A postwar Auster Mk.V, restored in wartime colours. ^ a b Halley 1988, p. 448. ^ Bowyer and Rawlings 1979, p. 79. ^ Flintham and Thomas 2003, p. 95. ^ Flintham and Thomas 2003, p. 187. ^ Halley 1988, pp. 444–451. ^ Jefford 2001, pp. 102–104. ^ a b c Jefford 2001, p. 104. ^ Sturtivant and Hamlin 2007, p. 131. Jefford, Wing Commander C.G., MBE, BA, RAF(Retd.). RAF Squadrons, a Comprehensive record of the Movement and Equipment of all RAF Squadrons and their Antecedents since 1912. Shrewsbury, Shropshire, UK: Airlife Publishing Ltd., 1988 (second edition 2001). ISBN 1-85310-053-6. This page was last edited on 20 February 2018, at 11:33 (UTC).